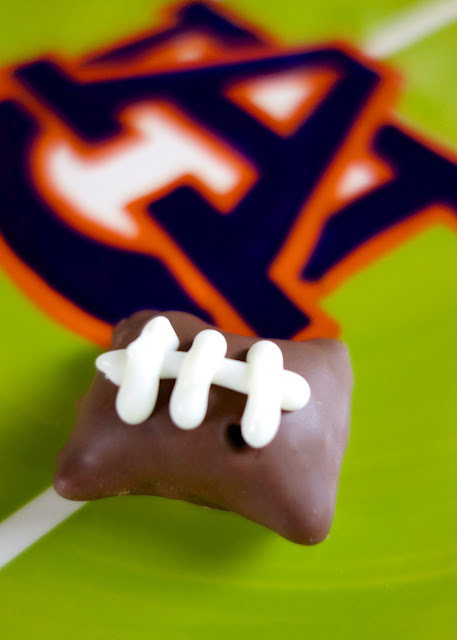 Chocolate Dipped Football Pretzel Bites - easy no-bake football party food! SO easy and SO adorable!!! Tastes like a butterfinger. Peanut Butter filled pretzels, chocolate candy coating, white candy melts and a squeeze bottle. A must for tailgating! Saturday is A-Day for both Auburn and Alabama. I am really excited to see our football friends and get a taste of college football for a day! No football gathering is complete without food. 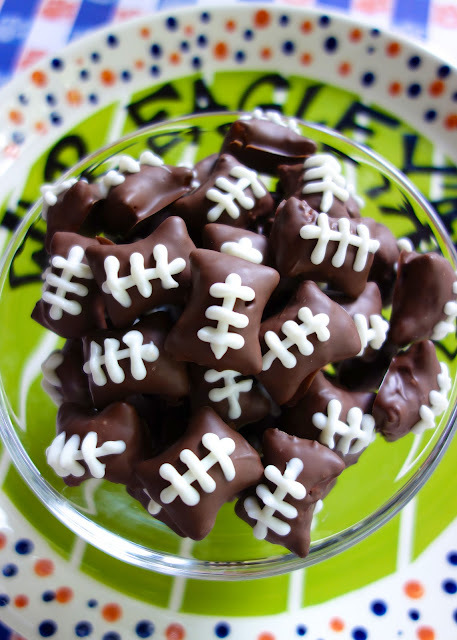 I made a batch of these super cute chocolate covered peanut butter pretzel football bites - that's a mouthful - for the party tomorrow. The main event in Auburn on Saturday is "The Last Roll". We are rolling the Auburn Oaks at Toomer's Corner one last time. Growing up in Auburn, rolling Toomer's has been a part of my life for as long as I can remember. It will be bittersweet to roll the original oaks on Saturday, but I look forward to the future oaks and keeping the tradition alive. War Damn Eagle! Lay out a big sheet of wax paper. Melt chocolate almond bark according to package directions. Dip desired amount of pretzels into chocolate and shake off excess. Place pretzels on wax paper and let dry (only takes about 5 minutes). Melt white candy melts in squeeze bottle according to package directions. Pipe laces on top of dipped pretzels. Allow to dry. Enjoy!